Organisers of Edinburgh's Hogmanay celebrations are confident the recent severe winter weather will not return to dampen the party. Artistic director Pete Irvine said clear skies were forecast for the four-day event and temperatures were expected to be well above freezing. Organisers said they were encouraging revellers not to bring under-16s. Meanwhile city centre residents may be charged £15-per-guest if hosting a New Year's party of more than six people. Princes Street residents are given six free passes per household to allow them access to their homes during Edinburgh's Hogmanay street party, with extra passes subject to a £15 levy unless they can demonstrate that they are for genuine house guests. The capital's events champion Steve Cardownie said there were outstanding fears that Princes Street residents may be tempted to abuse their free allocation, and said the levy "discouraged entrepreneurialism". Mr Irvine said people should dress for a "good Scottish winter and a great outdoor Scottish party". About 80,000 revellers are expected to descend on Edinburgh city centre for an open-air concert, ceilidh and street party. Assistant Chief Constable Mike McCormick, of Lothian and Borders Police, said: "About 330 officers and 450 stewards will be on high visibility patrol in the event arena and surrounding area, to address any concerns or answer any queries from revellers. "Partygoers should also remember that once they have entered the arena, and their ticket has been checked and split, they will not be able to get back in if they chose to leave." David Farquharson, NHS Lothian medical director, said: "Be sensible about how much you drink and bear in mind that alcohol lowers your body temperature. So pace yourself by having soft drinks as well." Jim Watson, public weather service advisor for the Met Office, said: "The forecast is looking good for Edinburgh's Hogmanay celebrations. It should stay predominantly dry but cloudy, with temperatures staying above zero and a light, easterly wind." The weather is expected to be dry and clear for Hogmanay celebrations across Scotland. 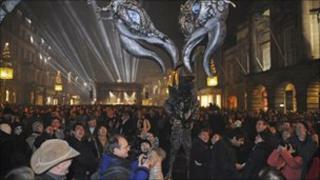 Highlights include Glasgow's George Square New Year Party and Stonehaven's Fireball Ceremony. Inverness has the Red Hot Highland Fling and Stirling Castle has a Hogmanay shindig. Tickets for Edinburgh's Hogmanay Concert in the Gardens, with headline act Biffy Clyro, have already sold out. Organisers said there were tickets available for the Hogmanay street party, at a cost of £15 each, but they should be purchased before 31 December as there were likely to be long queues at the official box office. The Street Party features live music from The Coral and Newton Faulkner as well as DJ sets from acts such as Kaiser Chiefs. Edinburgh's Hogmanay launches with a new opening event on Thursday in Resolution Square - the newly-named event space on Mound Precinct. There will also be the popular Torchlight Procession and Son et Lumière. It continues with the Street Party on Hogmanay and a new set of events on New Year's Day and 2 January. Meanwhile actor and singer Michael Ball launched a charity campaign in Edinburgh, which will see people's personal New Year's resolutions for 2011 being displayed on four giant screens in Princes Street. Revellers at the Street Party are being invited to text ELEVEN + their message or resolution to 82055. Texts will be charged at £1 plus the standard message rate, and 25p from each text will be donated to Help for Heroes - a charity supporting injured servicemen and women. Lines open on 1900 GMT on Friday 31 December and close on Saturday 1 December at 1800 GMT. Messages will be displayed throughout New Year's Eve, and again on New Year's Day as part of the One Day celebrations in Resolution Square.